On 23-24 January, “Vilnius Tech Park” held an international conference “WindMission Lithuania 2019” which goal was to discuss and reveal the potential for the Lithuanian wind power sector. This was the first big event of such kind bringing together almost 200 energy experts from Lithuania and other countries. Conference was organized by the “The Voice of Renewables” together with Lithuanian Wind Power Association. Conference was opened by the Minister of Energy of Lithuania, Žygimantas Vaičiūnas. He reminded the country’s ambitious plans: to produce 100% of electricity and heating from renewable sources by 2050. It was stressed, that in National energy strategy, wind energy plays the biggest role. Together with Virgilijus Poderis, the Chairman of Parliament’s Energy and Sustainable Development Commission, the Minister participated in the Q&A session. The conference had two other expert panel discussions. On the first day, the leaders of “Lietuvos energija”, SEB Bank, “Deloitte”, The Ministry of Energy and “Enefit Green” discussed about investing in the market of renewable sources in Lithuania. On the second day of the event, the panel participants tried to find answers to the question regarding the future of the wind energy in Lithuania. “BOD Group” chairman, Vidmantas Janulevičius read a paper on the opportunity to combine solar and wind power plants. Paulius Zapolskis from the law firm “TGS Baltic” introduced the legal peculiarities of the new auction model. “Mott MacDonald”, “DNV GL”, “Megajoule” and other companies shared more about the sector’s innovations. A report, based on a personal experience, for a search for the sustainable energy solutions was read by Giedrius Širka, the singer of the popular local music band “Golden Parazyth”. The head of LWPA, Aistis Radavičius further presented a solid contribution of the wind energy to Lithuania’s economic growth. “The development of wind energy contributes both to bigger energy independence and to country’s GDP growth.” It is expected that the sector will attract more investments in the future. “Therefore the overall turnover of wind energy sector and employment will grow”, says A. Radavičius. Among the participants of the event there were representatives from different supply chain companies of wind industry. 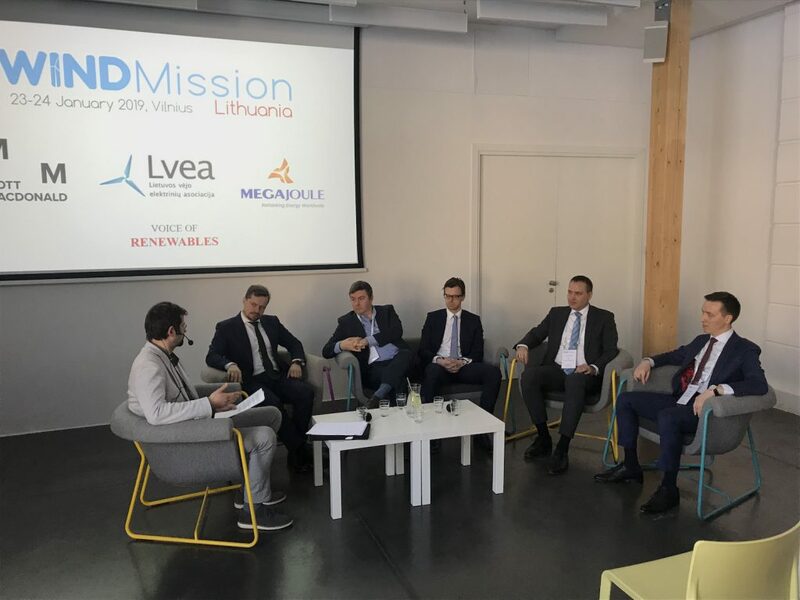 “WindMission Lithuania 2019” became a platform where both the decision makers and the project developers of the wind energy come together. Turbine and component manufacturers, service providers as well as scientists and, analysts took part in the discussions and presented their insights, products or services.